Are you looking for an ultra-easy and painless way to remove unwanted facial hair and body hair? The Hangsun women’s painless hair remover F100 is the best choice for you. This discreet and stylish facial and body hair remover is sleek and discreet. The head is hypoallergenic and gentle on all skin types. No nicks, redness, or irritation. A finish is as smooth as waxing! And, with facial hair gone, your makeup application is very easy. 1. For superior result, use on hair 0.5cm in length or less. 2. If the unit begins to slow down, clear the hair removal head and body of any hair reside. 3. If the unit is still running slow, change the battery. 4. Gentle enough to be used every day. 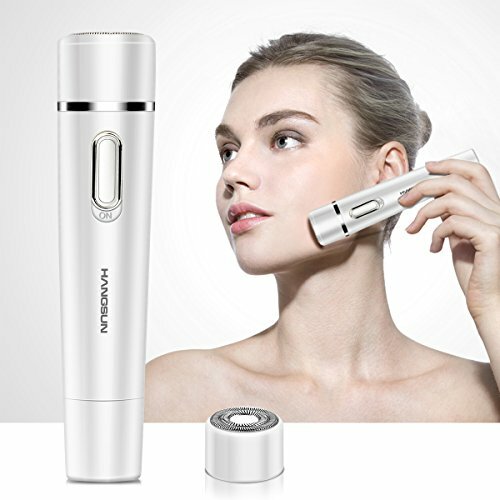 Painless Hair Removal – Hangsun hair removal epilator instantly and painlessly removes fine, downy fluff and even coarse hair on your lip, cheeks, chin and arms, leaving behind only smooth skin. Eliminate peach fuzz on your face for a smoother application of foundation and powder. Lightweight and Portable – Girls’ mini shaver has a chic, feminine look and slimline design so you can pop it in your purse for frequent, fast touch-ups! Easy To Use and Clean – Washable and removable cutter head, can be easily taken down and washed after use. Only need 1 AA battery supply, saving energy and environment. Safe on All Skin Types & Tones – The blades designed with anti-allergic material are not direct contact with skin, but cut hair from the root fast and quickly. No more cuts from razors. No more redness and irritation. No More Costly Salon Visits – Save yourself the time and pain of waxing and threading. Throw away those unpleasantly-scented chemical hair removal creams.